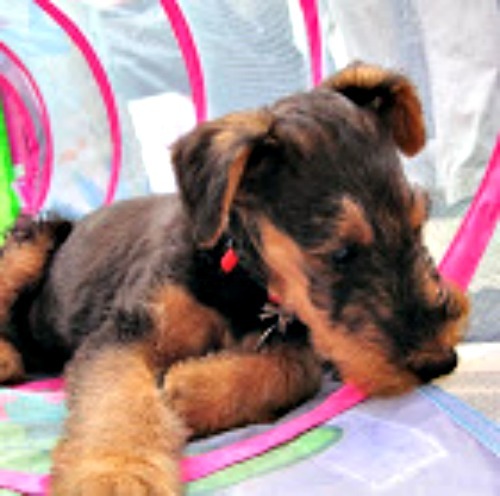 Ruby the Airedale: National Puppy Day! here are some of my most FABulous BABY pictures! Nows, give your puppers a HUG! OMD, you were such a cutie patootie, Ruby! I'll have to tell my ghostwriter she should have taken today off work so she could find some puppy pictures of me! But you look very, very cute! Are ya trying to give da momma PUPPY FEVER? How cute to see your puppy pictures. You've loved your tunnel from day one. OMD, Ruby! You were such an incredibly cute puppy!!!! And I loved seeing Puppy Ruby in her tunnel. What a CUTIE!!! Great pictures Ruby, and grrrreat suggestion re the cookies. Ruby my darlin' gal pal....just when I thought you were the most gawgeous you show me 87xs more gawgeousnees in your baby photos. I squealed!! sooooooo sweet! you were an adorable BABY... alas, we have no puppy pics of Big Boy.. his life started 5 months ago but he is almost 6 years old. Ruby, I dpn't think I've ever seen an airedale puppy before. One of those pictures must be beside the word "adorable" in the dictionary! Everyday should be puppy day. You were a most cute puppy, Ruby. They're not puppies any more but hugs and treats work. Charlee: "You sure were a cute puppy, Ruby!" Chaplin: "Which is only to be expected because you are such a cute grownup!" Oh Ruby what a little cutie you were - and still are! !